I’m paraphrasing Bill Gates and praying for some sort of disruption in the ticketing business after another terrible experience this morning trying to buy some tickets to an Australian Football League (AFL) match from Ticketek. Today’s post starts off a little negatively but finishes with what can be learned from the situation so stick with it. As a mad Carlton supporter (Go Blues!) I usually get along to the first game of every season. The tickets to that game were available from Ticketek’s website at 9am on Friday, March 4. Wanting to get good seats, I was online pretty much at 9am on the dot. Three times I went through the process of logging in, inputting my membership number, selecting my seats, and attempting to pay for the tickets (including a $2.70 fee to print the tickets myself) before the site would crash and send me back to the home page. After the third occasion (almost an hour after I’d begun trying), Ticketek’s website was throttled – a message on the screen told me I wouldn’t be able to get on to the website until others had left it. A twenty second timer counted down between attempts to let me in. I tried calling them but all I got was an engaged signal. This has happened almost every time I’ve called them in the past. To push people to purchase tickets using their website (which is obviously a much lower cost channel for them) Ticketek under-resources its contact centre leading to inordinate wait times or simply an inability to get through to it. Note the time of that tweet? Almost an hour and a half after it would have been abundantly clear that Ticketek’s systems weren’t coping with the volume of traffic that was hitting them. So what are the lessons companies can learn from this experience – one that has made me enough of a Detractor to write a post about it? Prepare for customer demand. Its common sense but time and time again we see websites crashing because companies have underestimated customer demand. If you are an online company, spend whatever is needed to over-provision your systems to ensure they can cope with higher than expected volumes of traffic. Communication is critical. I wasted an hour this morning trying to spend my hard earned with Ticketek. As soon as it was known there was an issue, a message should have gone up on the website letting people know there was a problem. And rather than an engaged signal, use an IVR to communicate the same thing to callers. People are a lot more sympathetic to your plight when they know what is going on. Take ownership. Your customers’ time is important. If you’ve just wasted a ton of it, apologise. Then tell people what happened and what you’ll be doing to ensure it doesn’t happen again. In this regard, the AFL has only partially succeeded with their press release. Don’t charge fees that negatively impact customer loyalty. I’ve written about bad profits before and Ticketek’s fee to email customers soft copies of their tickets for them to print themselves is a prime example. Not only do I have to pay an exhorbitant fee for an email to be sent to me, I then have to spend my time and money (printer ink isn’t cheap you know!) printing the damn things. And if you think you could avoid this fee by having mobile tickets sent to you, think again. Ticketek charge a $2.70 fee to send you those as well. Outrageous. See any commitments in there about the type of experience they’re going to deliver you each and every time you deal with them? Me either. Hopefully today’s experience has taught Ticketek and the AFL a lesson or two and their service improves from now on. Post script: At 3:20pm on Friday, just as I was putting the finishing touches to this post, I received the following email. It was a little late, but well done, AFL Membership – this is exactly the type of communication I referred to in point 2 above. 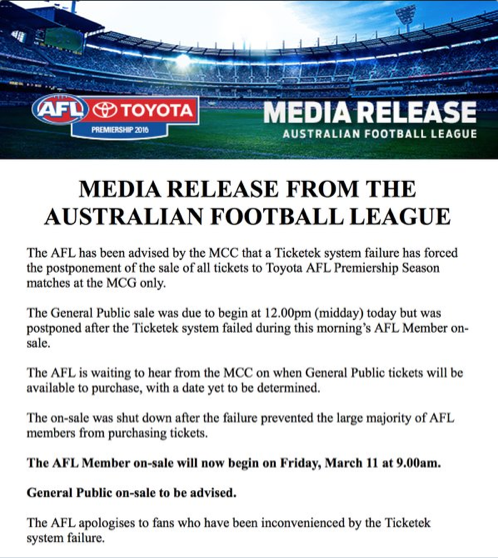 As you may be aware, a major Ticketek system failure has forced the postponement of the sale of all tickets to the 2016 Toyota AFL Premiership Season matches at the MCG. The system failure affected this morning’s AFL Member Rounds 1-6 on-sale and we sincerely apologise for the major inconvenience to many of our AFL Members. This failure does not meet our standards of making your football experience better and we are currently in contact with the MCG and Ticketek to ensure they are working towards meeting those standards. Once again we apologise for this inconvenience and we share in your disappointment. AFL CEO Gillon McLachlan has today contacted the MCC to express his disappointment at the service delivery to AFL fans by the ticketing agency, Ticketek. 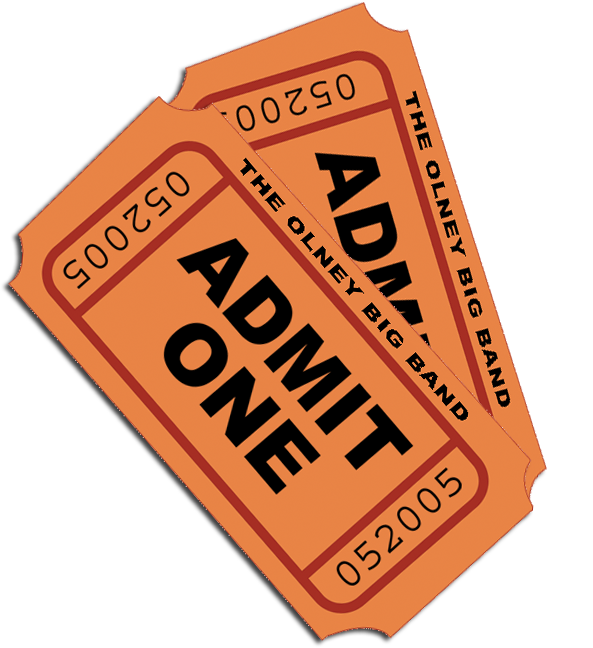 “While ticket sales have been strong, the service to many fans has been frustrating,” Mr. McLachlan said. “As AFL CEO, I am disappointed for AFL members who were impacted this morning. Mr McLachlan said the problems were even more disappointing given the Ticketek system failure last week. “Being forced to postpone last week’s planned on-sales was already deeply concerning,” Mr McLachlan said. The AFL will be meeting again with the MCC and Ticketek in the coming week. The story made the front page of the local newspaper the following day. I suspect we haven’t heard the last of this. Hey Ben. Great post. Nothing worse than a failed transaction, particularly when it relates to AFL tickets! It’s not like you have another option which is why I assume you persisted for so long. Majority of other online services can’t afford such luxury I’d add a key learning…get a good monitoring solution in place and fix the system issues so they don’t impact users! Great extra key learning Dave! Thanks for sharing! And yes I’m really THAT keen to see Carlton play their first match. We’re undefeated so far this year!